These are common queries that you’ll hear in about 50 million households across the United States that have purchased smart speakers. As consumers grow more comfortable with using their voice, voice searches are rising on smartphones, tablets, and other mobile devices with voice assistants built-in. In this article, we will take a look at how these trends could impact the eCommerce industry and how you can optimize your website to target these new customers. Voice assistants have grown increasingly popular over the past several years. 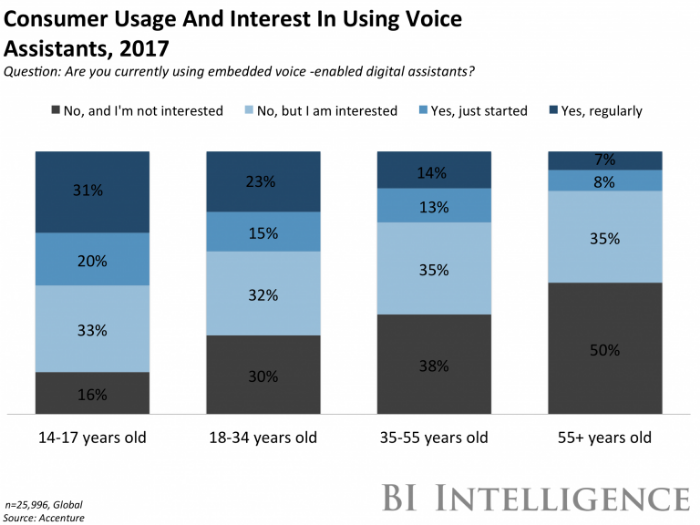 About 40 percent of millennials have already started making search queries through a voice assistant prior to making a purchase, and half of 55+ year olds are at least interested in voice-enabled digital assistants. These trends are driven by increasingly accurate software algorithms with 95+ percent accuracy, as well as a growing number of hardware options for consumers. Apple’s Siri and Google’s Assistant were early pioneers on the smartphone, but Amazon Alexa spawned a new class of in-home assistants. With such strong interest in these devices, it’s not inconceivable that U.S. market penetration could reach 150 million households in the near future. That’s more than 60 percent of the U.S. population! The growth in voice search is a game-changer for traditional search engine optimization (SEO). Download our free worksheet to determine the best voice search queries to target. Most search engine optimization campaigns focus on keywords and keyword phrases. For example, an eCommerce shop might optimize for the keyword phrase “intel laptop with nvidia” since most web search users have been conditioned to use succinct search phrases with feature or brand-related keywords. A comparable voice query might be, “What’s the best laptop for gaming?.” These voice users are much more likely to describe benefits over features, use long-tail keywords, and incorporate trigger words, like “how,” “what,” and “best.” They are also much more verbose than they would be with a web search. It’s important to update your SEO strategy to target these kinds of phrases to remain competitive. For example, you might target long-tail, conversational search queries rather than—or in addition to—succinct feature-specific keyword phrases. You may also have to use different strategies for different providers. Voice search is much more skewed toward the top search result than a typical text search. After all, a voice assistant is most effective when it reads out a simple response to a question rather than list a large number of resources. This means that top search results, and snippets, are most important. Don’t forget to download our free worksheet to determine the best voice search queries to target. 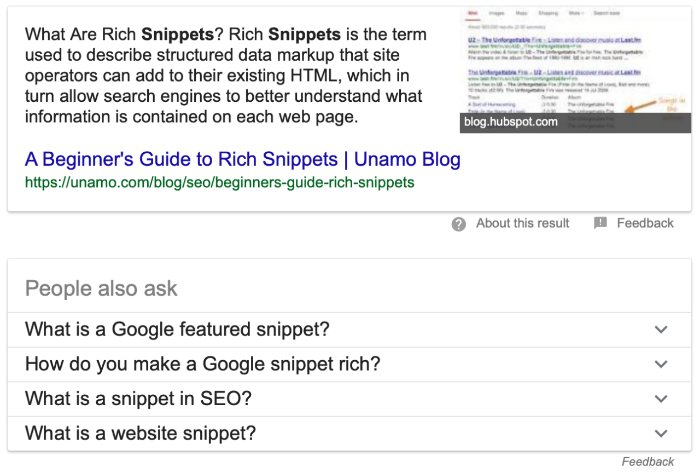 Google and other search engines use snippets to provide quick answers to common questions. In fact, the user doesn’t even have to leave the search results page to get a quick answer. These snippets double as a source of information for voice search queries, which simply read the snippet contents. The key to success for Google’s Assistant or Apple’s Siri (which uses Google search) is becoming the snippet. Often times, that’s done through a series of simple technical steps and by providing the most comprehensive source of information. Restate and answer the question succinctly. Incorporate relevant keywords in the URL, title, and H1 tag. Use natural language (as you would speak) in the response. You can find target voice queries by searching social media or Internet forums. Oftentimes, users will use more natural language when asking questions on these venues. You should be on the lookout for long-tail keywords to target and the trigger words surrounding those keywords to help form questions. Amazon’s Alexa differs in that the target is typically the Amazon Choice designation rather than search snippets. For example, an Alexa user may say, “Alexa, order me some soap,” and Amazon’s algorithms will choose the best soap from its FBA database and automatically place an order. The Amazon Choice designation is made based on a variety of factors, including popularity, ratings and reviews, availability, and shipping speed. Only products that are available via Prime and FBA, or sold through the Seller Fulfilled Prime, are eligible for the designation. Make your products available on Amazon Prime. Maintain ample stock to avoid shipping delays. Proactively manage your product reviews. Follow Amazon’s guidelines for product details. Many customers use voice search for their initial product research, but that doesn’t mean they don’t dig for more details. For example, an iPhone user may ask Siri for the best laptops and arrive at your website, but they still have to filter through the laptops to find the one they want. In these cases, it’s important to optimize your site search and product lists to help them quickly find products. Site search optimizations can help ensure that users find relevant items based on search queries. For example, you may want to include features like autocomplete to help customers—particularly those on mobile devices. Product lists should be organized based on the products that customers are most likely to purchase. For instance, you may want to consider Avatria Convert, which uses machine learning to predict optimal product list orders. It’s equally important to ensure that your website is easy to browse and navigate on a mobile device. Voice search is rapidly growing in popularity thanks to the rise in voice-assistants and smart home speakers. 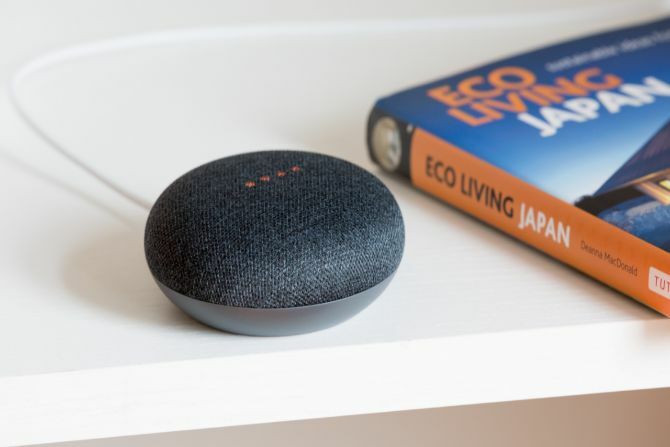 With nearly 20 percent of the population using smart speakers alone, eCommerce shops should expand their search engine optimization strategies to target these types of search queries. For more information on Avatria Convert, start your free trial today and see how optimizing product list order and impact your conversion rates. Download this free worksheet to help create the best voice search queries for your ecommerce shop to target.